Attention Deficit/Hyperactivity Disorder (ADHD) is a disorder that affects 5.4 million children between the ages of four to seventeen, according to the US Centers for Disease Control and Prevention. Although this disorder was first documented in 1845, “rates of ADHD diagnosis increased…an average of 5.5% per year from 2003 to 2007”. Furthermore, boys are more likely to be afflicted by this disorder. Raising Boys With ADHD: Secrets for Parenting Healthy, Happy Sons by parents James W. Forgan, Ph.D, and Mary Anne Richey explores this disorder in depth. 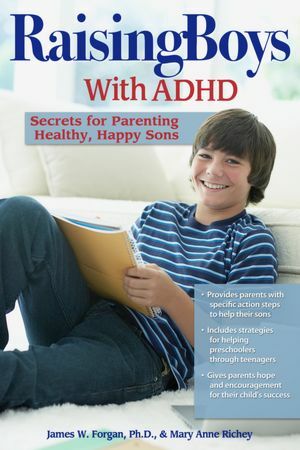 Written by two professionals who have “been there and done that” with their own sons with ADHD, Raising Boys With ADHD empowers parents to help their sons with ADHD find success in school and beyond. The book covers topics not often found in other parenting guides such as the preschool years and early diagnosis and strategies for teens transitioning to work and college. Filled with practical knowledge, resources, and tools needed to help parents address the many strengths and challenges of boys with ADHD, this book provides parents with encouragement and hope for the future. What concerns me with ADHD is the prevalence of medication in treatment. According to the CDC, 66% of children with ADHD are treated with pharmaceuticals with boys being “2.8 times more likely to take medication than girls”. I know several families that have opted for homeschool when public education failed to meet or understand the needs of their sons with ADHD. If a book like this one can help children and parents cope and learn strategies for living successfully with ADHD, then I am all for it. I also think this book would be helpful for families with daughters suffering from the effects of ADHD. Without knowing which behavior problems you are having the most difficulty, it is hard to advise. I would, however, spending as much time in nature as possible with your son. Nature is calming. Earthing may help him. Contact with the earth is very powerful for grounding. I have a son with ADHD and so far he is doing great in school (private). He takes Focalin 10m in the mornings before school, he only takes it when he has school. The only problem we have with him is that he doesn’t like to eat fruits, we have to make him eat vegetables. Do you have any advice on should I make him eat fruits? I am raising my great nephew which is 13 . He didn’t have a good life with his father . He is starting to lie , hide things from us and is having a hard time in school due to the fact he has never had help. He refuses to let us help and when we do he gets very agitated . Any help would be great . All he thinks about us computer games and his xbox . My oldest son who is almost 10 was diagnosed with ADHD last year. Since then we have been on 3 different medications. Quillivant XR that cause terrible stomach aches, lose of appetite and sleep as well as weight loss. He was recently on Focalin which caused awful insomnia and decreased appetite! Most recently and currently on intuitive which leaves him live a zombie!! I hate all of the medications and side effects!! The Focalin and Quillivant really helped him academically but side effect out weighed the benefit!! I am at a loss on how tohelp him! Have they tried a lower dose of the medications? Maybe it would decrease the side effects. I have two sons with ADHD my 8 year old take 30mg Vyvanse and Guanfacine 1mg three times daily and my 6 year old takes 20mg Vvyanse and Guanfacine 1mg only after school. It has helped them both in school and at home. When they don’t get it and not when they first wake up you can see a huge difference in them. They also have other things going on like PTSD behavorial problems,change disorder, and the older one has ocd. Their doctor has tried a few different things and these ones worked the best for them. Hello! My son has been using a daily patch, which has helped him. The side effects on him are weight loss and be calm, but he doesn’t get depressed as he did with other medications. The med is called Daytrana. The dosage depends on what the doctor prescribes. I am so sorry. I wish I had an easy answer for you. Don’t give up. I read a wonderful book about kids and their temperaments and how to know our children better. The title is “I’m A Keeper” by Ray Lincoln, it may be helpful just to know all the ends and outs of your little guy. I also have a beautiful son. He was recently diagnosed with ADHD and possibly Dyslexia. It is hard to see our kiddos have labels, but they are incredible people. Keep searching for ideas. Thanks for writing. My son was diagnosed with ADHD at the age of 4. Preschool was awful and medications have been difficult. The one piece of advice that has helped me is to scroll on http://www.chadd.org. When I’m feeling I need advice or support I go on and look. I’m not a member but I look at the blogs. Always stay postive and everyday is a fresh start. He is 10 now and it gets better but the areas of difficulty change. Good luck in your journey!!! I have a Son he was diagnosed with ADHD and he is taking Concerta one pill every morning and its doing wonders for me ; but he has lost appetite . ADHD. It was making life very hard. The meds are helping, I have a great Dr. who is well informed. My son also shows real signs. So we have a close eye on him. It’s tough, please please please remember! they can’t articulate to you what is going on. A good book is driven to distraction.